Description A small area of western Pennsylvania around Pittsburgh has produced almost 25 percent of the modern era quarter­backs enshrined in the Pro Football Hall of Fame. That percentage is wildly disproportionate to the number of superstar quarterbacks any one state might claim, let alone a mere sliver of a state—an area representing just one-fifth of one percent of the total country. The list of the greats starts with George Blanda, the “old man” of the game, and continues with the incomparable Johnny Unitas, followed by “Broadway” Joe Namath, Joe “the Comeback Kid” Montana, Dan Marino, and Jim Kelly. Their stories, feats, and statistics are brought to life in America’s Football Factory through riveting anecdotes, extensive research, and exclusive interviews with their coaches, friends, family, and peers. Readers will appreciate getting to know these athletes as people, not merely as football heroes. Stewart also explores the many theories as to why one part of the nation has churned out so many greats. Hall of Famers Raymond Berry and Mike Ditka lavished praise on the first edition of this book. “Any fan of my era, of my friend Johnny Unitas, or, for that matter, any fan of football in general should enjoy Wayne Stewart’s book,” said Berry. Ditka, himself a Western Pennsylvanian, wrote in the book’s introduction, “You can’t get much better than the primary six men featured in this book.” He’s correct—upon their retirement, all six of the book’s featured quarterbacks were in the top 12 for touchdown passes, and five of them were in the top 10. 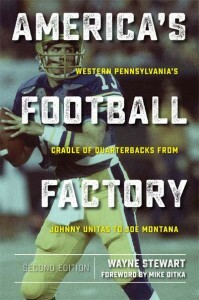 America’s Football Factory also features other greats from the Pittsburgh vicinity, including Johnny Lujack, Babe Parilli, and Marc Bulger, and the area’s best high school programs for producing quarterbacks are also discussed.